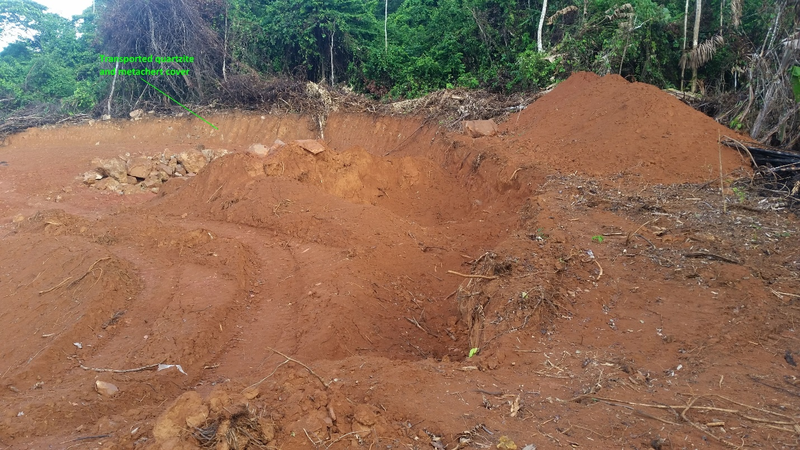 May 30, 2018 / TheNewswire / Vancouver, Canada - Guyana Goldstrike Inc. (the "Company" or "Guyana Goldstrike") (TSXV: GYA, OTC: GYNAF, FSE:1ZT) is pleased to report that the Company's geological team has completed trenching, mapping and sampling at the Paunch area on its Marudi Gold Project ("Marudi" or the "Property") located in the Guiana Gold Belt, Guyana, South America. Locke Goldsmith P Eng. P Geo., VP Exploration states "These results are very encouraging as they confirm the presence of gold in the new discovery area. This is the first of nine areas of interest that we plan to trench over the coming months in preparation for a phase one drill program. The results obtained from trenches A and L with peak gold values of 7.45 and 5.98 g/t Au are located further south and are closer to the ridge top than the other lower values." Mr. Goldsmith continues, "This is suggestive that the gold dispersion is down slope due to transportation and originates from a nearby, yet undiscovered bedrock source." Selected fire assay intervals from Paunch trenches A, B, C, and L are summarized in Table 1 below. Sampling of 166.2 m of trenching was completed with 106 horizontal chip-channel sample intervals taken along the base of trench walls. Two samples were collected from each sample interval. One sample was shipped to Actlabs in Georgetown for fire assay of gold and a second sample was panned by the Company to examine and determine if free gold was present in the heavy mineral concentrate. Paunch trenches A, B, C, (as previously reported: news release dated May 15, 2018) and L, with selected assay and gold count intervals. All samples collected during this program were delivered to Activation Laboratories Ltd. (Actlabs) located in Georgetown, Guyana for gold content by Fire Assay (FA). Actlabs is an independent commercial analytical facility and is ISO 17025 accredited and certified to 9001: 2008. With 25+ years' experience, with full analytical laboratories that perform high quality analysis to many industries around the world. A second sample was panned in camp to determine if free gold was present in the heavy mineral concentrate. If present, a visual count of gold points and an estimate of the amount of gold dust were recorded. A gold point is a piece that is noticeable as slightly larger than dust. Very fine gold dust particles may be counted in the range of 1 to 10 but greater amounts must be estimated because the eye does not distinguish between individual specks in a finely divided, closely packed concentration. 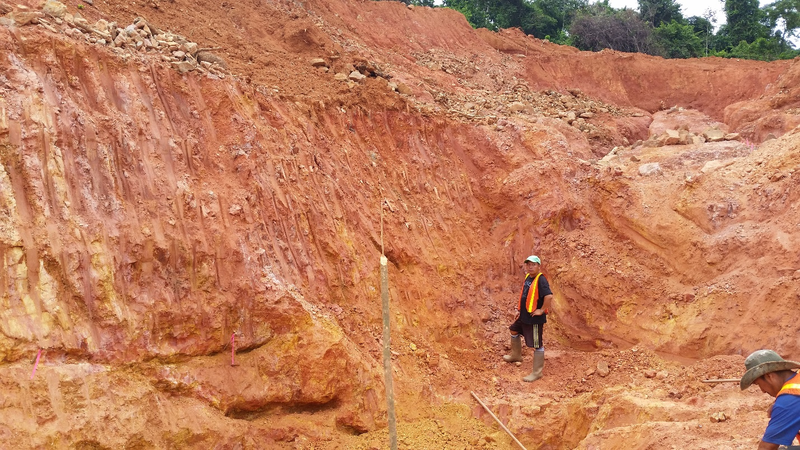 Gold, when observed in a pan concentrate at the time of trench sampling, is an indication that trench extensions and additional trenches may be advisable. The trend of greater or lesser amounts of gold over distance may suggest a vector towards a bedrock source. Counts of gold in pan concentrates are compared as a check with results from fire assays. 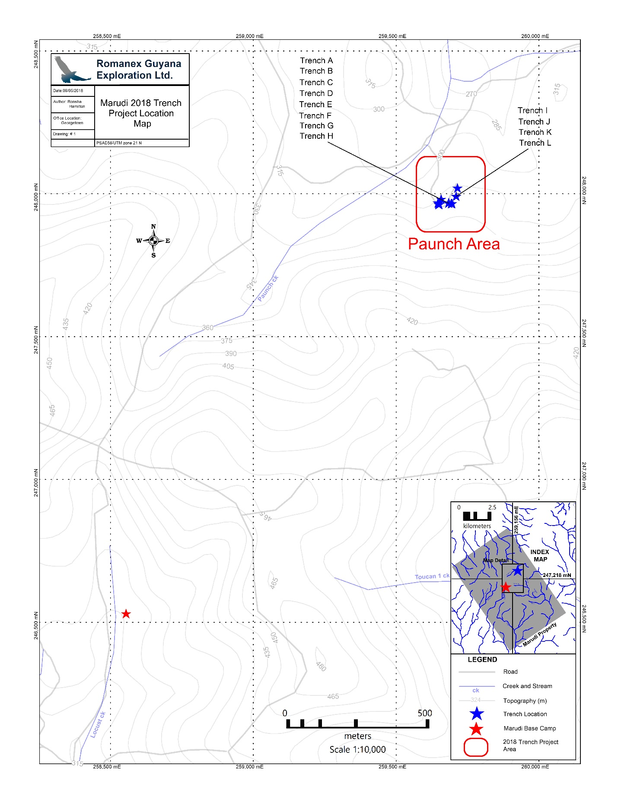 Paunch trenches predominantly contained gold dust from pan concentrates in appreciable quantities (100+) and an absence of wire or angular gold suggesting that transport has occurred and has originated from a nearby bedrock source. In the Paunch trenches saprolite is developed on silty metasediments. Strike of bedding varies between 264?- 282? and dip varies between 73?-80? S. Where present, discontinuous and fractured 0.5 to 3 cm-wide quartz veinlets strike subparallel to bedding and dip 45?- 59? S.
Actlabs crushed, pulverized, and sized each sample on an 80-mesh screen. A sufficient fraction of all 106 samples for a 30-gram fire assay charge passed the 80-mesh screen. The coarse fraction remaining on the 80-mesh screen was sufficient for a 30-gram fire assay charge from 55 of the 106 samples; assays of the two fractions were totaled for presentation on trench assay plans. 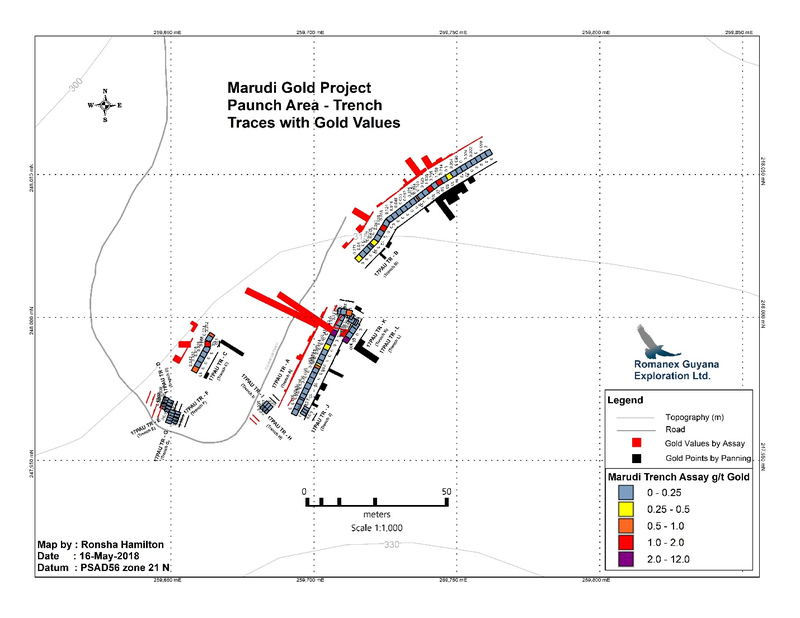 The Company is developing the Marudi Gold Project located in Guyana, South America, the project is unique in that it has a mining license in good standing, all-season road access, infrastructure in place, with an established mining camp serviced by employees, service buildings, and a full-time mining manager. The Property has three known gold bearing areas, specifically the alluvial areas, the saprolite, and the underlying hard-rock.